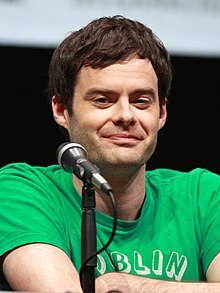 بیل هیدر (اینگیلیسجه: Bill Hader) آمریکالی اوْیونچو. ۷ ژوئن ۱۹۷۸ ‏ ایلینده آمریکادا دۆنیایا گؤز آچیب. 2006 Late Night with Conan O'Brien Announcer / Vincent Price (voice) Episode: "The Skeleton Show"
Tim and Eric Awesome Show James Quall Episode: "Jazz"
2010 Ugly Americans William Dyer (voice) Episode: "An American Werewolf in America"
30 Rock Kevin Episode: "Live Show"
2012 NTSF:SD:SUV:: Tad McMilrthy Episode: "Comic-Con-Flict"
2013 Portlandia Birdman Episode: "Blackout"
2013 The Office Himself Episode: "Finale"
Drunk History John Pemberton Episode: "Atlanta"
"| Episode: ""Bill Hader Wears A Grey Button Down Shirt & Sneakers""	"
2014 Saturday Night Live Himself (host) Episode: "Bill Hader/Hozier"
Randy Cunningham: 9th Grade Ninja Whoopee 2 (voice) Episode: "Whoopee 2: The Wrath of Whoopee 2"
2015 Man Seeking Woman Adolf Hitler Episode: "Lizard"
Inside Amy Schumer Cliffley Bennett / Doug Episode: "I'm Sorry"
Brooklyn Nine-Nine Captain Seth Dozerman Episode: "New Captain"
2016 Silicon Valley Pipey (voice) Episode: "Daily Active Users"
2018 Saturday Night Live Himself (host) Episode: "Bill Hader/Arcade Fire"
2008 Grand Theft Auto IV Wilson Taylor Sr.
"| style="background: #99FF99; color: black; vertical-align: middle; text-align: center; " class="yes table-yes2"|قازانمیش	"
↑ First Trailer for Steven Spielberg's Roald Dahl Adaptation 'The BFG'. یوْخلانیلیب2015-12-10. ↑ Jones, Nate (March 30, 2016). You Probably Won't Marry Bill Hader or Kate McKinnon, But in Finding Dory They Will Play Fish Who Are Married to Each Other. Vulture.com. یوْخلانیلیبMarch 31, 2016. ↑ 'Power Rangers' Reboot Casts Bill Hader as Beloved Character. The Hollywood Reporter. یوْخلانیلیب23 September 2016. ↑ Power Rangers B-Roll Footage Shows Bill Hader As Alpha 5. اینگیلیسجه ویکی‌پدیاسی‌نین ایشلدنلری طرفیندن یارانمیش«Bill Hader»، مقاله‌سیندن گؤتورولوبدور. ( ۲۲ ژانویه ۲۰۱۸ تاریخینده یوْخلانیلیبدیر). قارداش پروژه‌لرده بیل هیدر گؤره داها آرتیق بیلگی‌لر تاپابیلرسینیز.